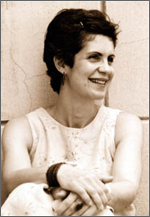 Adrianne Kalfopoulou is a poet, essayist, and scholar. She lives and teaches in Athens, Greece where she currently heads the English and Modern Languages Dept. at Deree College. She is also a poetry and nonfiction faculty mentor in the low residency Mile-High MFA program at Regis University. She has taught in the Masters Program of the Englisches Seminar at the University of Freiburg, the Graduate Writing Program at New York University, and writing workshops at the University of Edinburgh, and the Aegean Arts Circle on the island of Andros. Her scholarly work has focused on 19th and 20th century American literature, and more recently Ralph Waldo Emerson’s influence on Sylvia Plath's poems.